A Single bedded room with en-suite, tea and coffee making facilities, mini safe and internet access. Sky channels and in room movies (additional charge) also available and use of the leisure facilities is included. A spacious double bedded room with en-suite, tea and coffee making facilities, mini safe and internet access. Sky channels and in room movies (additional charge) also available and use of the leisure facilities is included. Y All our twin rooms are spacious and include 2 single beds with en-suite, tea and coffee making facilities, mini safe and internet access. Sky channels and in room movies (additional charge) also available and use of the leisure facilities is included. Our spacious family rooms, include 2 double beds and are ideal for families. The room has en-suite, tea and coffee making facilities, mini safe and internet access. Sky channels and in room movies (additional charge) also available and use of the leisure facilities is included. There is space available for an extra bed or cot. All our Executive Double rooms have stunning views of our Golf Course and the North Surrey Downs. This spacious double bedded room with en-suite, tea and coffee making facilities, mini safe and internet access. Sky channels and in room movies (additional charge) also available and use of the leisure facilities is included. This is an ideal room for special occasions. All our Executive Twin rooms have stunning views of our Golf Course and the North Surrey Downs. This spacious room has 2 single beds, en-suite, tea and coffee making facilities, mini safe and internet access. Sky channels and in room movies (additional charge) also available and use of the leisure facilities is included.All our Executive Twin rooms have stunning views of our Golf Course and the North Surrey Downs. This spacious room has 2 single beds, en-suite, tea and coffee making facilities, mini safe and internet access. Sky channels and in room movies (additional charge) also available and use of the leisure facilities is included. Our spacious Executive Family Rooms have stunning views of the Golf Course and North Surrey Downs with 2 double beds, are ideal for families. The room has en-suite, tea and coffee making facilities, mini safe and internet access. Sky channels and in room movies (additional charge) also available and use of the leisure facilities is included. There is space available for an extra bed or cot.Our spacious Executive Family Rooms have stunning views of the Golf Course and North Surrey Downs with 2 double beds, are ideal for families. The room has en-suite, tea and coffee making facilities, mini safe and internet access. Sky channels and in room movies (additional charge) also available and use of the leisure facilities is included. There is space available for an extra bed or cot. -Cedar A la carteThis beautiful room overlooks the great Cedar Tree and the North Surrey Downs. 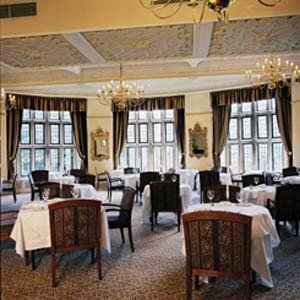 With stunning bay windows and a stained glass ceiling what better place to enjoy a relaxing meal. Smart casual ? No Jeans or Trainers. -Tempus Salads, sandwiches and snacksA modern contempary bar area with informal seating offers a relaxing yet inviting space to enjoy a light meal and quiet drink. The bar offers a variety of Spirits, beers and wines. Just minutes from Croydon Town Centre and only 13 miles from Central London. It is easily accessible by road, rail (East Croydon Station) and air. It is just a short drive from both Gatwick & Heathrow International Airports.